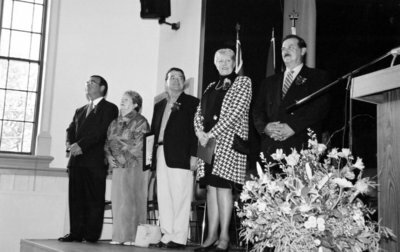 A black and white photograph of the Grand Reopening Ceremony for the Whitby Centennial Building. In this picture from left to right: Regional Councillor Gerry Emm, Whitby Councillor Shirley Scott, Jim Flaherty, MPP, Judi Longfield, MP and Mayor Marcel Brunelle. Grand Reopening of the Whitby Centennial Building, June 14, 2003, Photographer Unknown. Whitby Archives A2013_033_017.